Researching the best online resources to help those out there that are suffering in silence...As I find new resources, they will be added to this page. The listing is alphabetical - no preferential placement is available on this page. To Visit, Click on Image! This has to be one of the best sites I have seen yet. It has self-assessments, workshops, and all sorts of information and reference materials. If you are wondering if you have PTSD, this website is an excellent place to start your search for answers. This website is also a veritable wealth of information for spouses and loved ones. This is a MUST VISIT!! Alcoholism is a disease that destroys the lives of many vets and their families. Often, it is the family members who suffer the most. Al-Anon provides support for family members of problem drinkers. AMVETS has a page dedicated to links in the support community that will help with a variety of issues. It is no coincidence that PTSD is the first tab. Coaching Into Care (CIC) is a free and confidential telephone-based coaching service for family members and friends of Veterans to learn about post-deployment stress and other mental health issues and to discover new ways to talk about their concerns and treatment options. 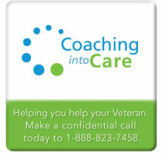 Reach out to us at 888.823.7458 Monday through Friday 8AM to 8PM Eastern or anytime at www.va.gov/CoachingIntoCare. This is another grassroots organization dedicated to helping the combat veteran coping with PTSD and TBI. They are a great group of people and are compassionate. They are passionate about what they do and are single-minded in their efforts to help. Give them a look-see. HOPE4PTSDVETS.ORG is a 501(c)3 nonprofit organization founded in 2011, by veterans for veterans and their families suffering from combat trauma. Our Mission: To provide hope and holistic healing and wellness strategies to veterans and their families suffering from combat trauma. As a wife of a 100% disabled veteran with PTSD, my passion is to provide help and hope for all the loved ones who support their veterans and warriors with PTSD. I encourage all loved ones of veterans and active duty military to join some kind of support group with others who can offer mutual encouragement and resources to help. For those who are unable to find a group near them, they can contact me at Love Our Vets www.LoveOurVets.org and I will help them start a group. Also, the website www.LoveOurVets.org offers information and an ongoing helpful blog for all who love a vet! This is the site for an amazing book. I read through this book in a matter of days and I can say this: For all of those mothers out there struggling to learn how to cope with the changes they see in their child, this book and this site is for you! This site was another great find. Their mission is to "empower warriors and their families in their life after war". They provide programs, resources and services to warriors and families impacted by combat stress and PTSD through a confidential and anonymous community. The site is well thought out and easy to navigate. A resource for the whole family, not just spouses or service members. LCDR (Ret) Cook contacted me about his manual and, upon review, found this to be a very good resource for the veteran who is fearful or mistrustful of going to others for help. I consider this to be a great 'self-therapy' book on learning to deal with PTSD. LCDR (Ret) Cook is passionate about helping the community and I commend him for his efforts. The manual will see additional modules in the future, according to Cook. Even if you are in treatment, I would bring this manual and its website to the attention of your docs at the VA or in the civilian world. I know that I have already instituted some changes in my habits based on recommendations and coping mechanisms he teaches - specifically with my penchant for taking naps during the day. The Program for Anxiety and Traumatic Stress Studies is a well-established program within the Weill Cornell Medical College Department of Psychiatry. Our staff, comprised of licensed psychologists and psychiatrists, is dedicated to providing state-of-the-art evidence-based treatments for the psychological syndromes associated with trauma, including Post Traumatic Stress Disorder (PTSD), depression, and co-morbid substance abuse. Our mission is to ensure that patients receive the highest quality of care across the continuum of psychological disorders, while also helping mitigate the impact of trauma on their lives. Given our unique geographic location, PATSS has been afforded the opportunity to treat populations affected by wide-scale disaster, most notably the victims of the 9-11 attacks. We have a long tradition of treating FDNY members, policemen and uniformed responders, some of whom are vets. In addition, we have transferred this knowledge base to successfully treat victims of the south Asian tsunami, Hurricane Katrina, and other natural disasters. Through the generous support of the McCormick Foundation, we offer a range of services for U.S. military personnel and their families with an emphasis on the major psychiatric issues facing those returning from combat (PTSD, Depression). All services are free and confidential. Anyone interested in our services should call 212-821-0783 to schedule a visit or find out more. This blog is written by Rod Deaton - a VA Doc. What I find so appealing about his blog is that he writes not in official capacity - but as a normal person with normal struggles. What makes his perspective VITAL to the conversation is that his blog's target audience is other medical professionals. Rod is not afraid to share his emotions about PTSD and Combat Veterans. Read his current blog post and you will understand. Sometimes we lose sight of the fact that our doctors at the VA are not to blame - they can't control the resources they have to work with. They can only reach out and help as many as resources and time will allow. I can tell that it hurts Rod deeply that he can't do more to help more veterans, but he is not giving up. We need remember to show compassion and understanding for the regular everyday folks who do care and work hard to better our lives and help us cope!! In their words, "Two People in Love, Dealing with PTSD/TBI". This blog is well-written from the perspective of the spouse and discusses a lot of the struggles that come with loving someone with PTSD/TBI. She does an amazing job of keeping it real and works hard to raise awareness. She also advocates for those that don't have a voice of their own. I encourage you to check it out! To Visit. Click on Image! This website is dedicated to making it easier for service members to gain access to the help that they need. There are even sections of the website dedicated to Family and Health Providers. Check it out! The Soldiers Project provides free, unlimited, confidential psychological counseling to those who have served or expect to serve in the conflicts in Iraq and Afghanistan as well as to their loved ones. This organization has a special site just for veterans who are struggling and are considering suicide. If you are thinking of hurting yourself, talk to someone who can help you through it and get you started on the path to survival. Volunteers of America recognizes the growing need for services for veterans and returning service members. They are currently working to expand their current veterans services to include supplementary services in mental health, job training and employment, female veterans' needs, etc. While veterans are not the only group of Americans they serve, the VOA is working aggressively to ensure that the services they provide for veterans grow with the demand for them.